Discussion in 'Tarantula Questions & Discussions' started by AbraxasComplex, Oct 15, 2011. Through out my experiences with keeping a variety of exotic amphibians, reptiles, and invertebrates I have experimented with multiple species of detritivores to provide housekeeping in my various vivaria. Needless to say, I have raised a number of useful scavengers and discovered some amazing combinations to provide cleaning services, and in turn, less upkeep for myself. This interesting selection of crustaceans, annelids, mollusks, myriapods, and insects devour animal waste, decaying plant matter, and the remnants of past prey items or molts. My collection owes a great bit of gratitude for their diligent efforts. From time to time though I come across a troublesome tarantula species that will not abide any of the detritivores I provide to share their home. With many of my dwarf species larger isopods become snacks between feedings and in heavily webbed tanks snails have issues retreating into the moist harbour of the substrate. 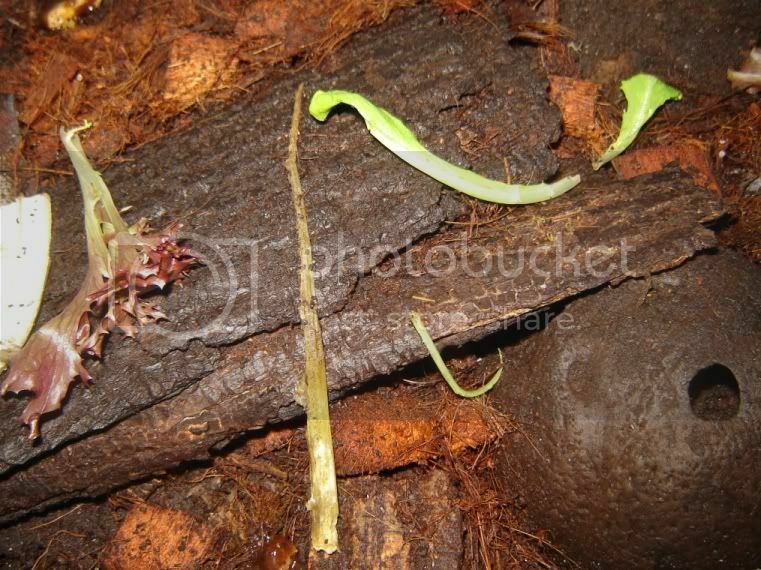 In some tropical terrariums I have even noticed that red wiggler worms falter with the wrong kind of substrate or with out overly damp soil. Others, though quite humid, became too hot for most of my pillbugs and millipedes, leaving numerous hollow chitin corpses. So these problematic tanks remained devoid of a healthy microfauna population unless I periodically introduced new additions. I was vexed with the fact that this was a nearly useless endeavor, as all of the newly populated vivariums would be barren of detritivores within a matter of weeks. Until now. Several months ago instead of pursuing a healthy social life I ended up cruising a dart frog forum for new inspiration and plants. To my surprise I discovered a gentleman selling some jewel orchids and bromeliads for reasonable prices in what I thought was a nearby area. After contacting him and venturing for what seemed like hours on public transit into the middle of nowhere I arrived at his door keen to increase my botanical collection. Instead of spending most of the small amount of cash I could spare on plants (who needs to eat when you have pretty plants to look at? ), I went home with one small jewel orchid and a container of dwarf tropical woodlice. Woe is me, I thought to myself as I shivered in the windy cold of some desolate graffitied bus stop, I've just purchased another endeavor that will probably disappoint like everything else I had previously tried. Sure my potential folly had only set me back $10, but think of all the boxes of Kraft Dinner[sup]TM[/sup] I could have purchased! Instead within a few months I was quite impressed. Not only did this new species increase in population dramatically within my problematic tanks, they also completed the combined jobs of several of my previous detritivores. But enough of my random adventures. Perhaps we should get to the facts? Hailing at only 0.5 cm full grown, this soft bodied isopod thrives in tropical and dark conditions. The best option when first establishing this species is to acquire an opaque container that retains moisture and keeps out light. 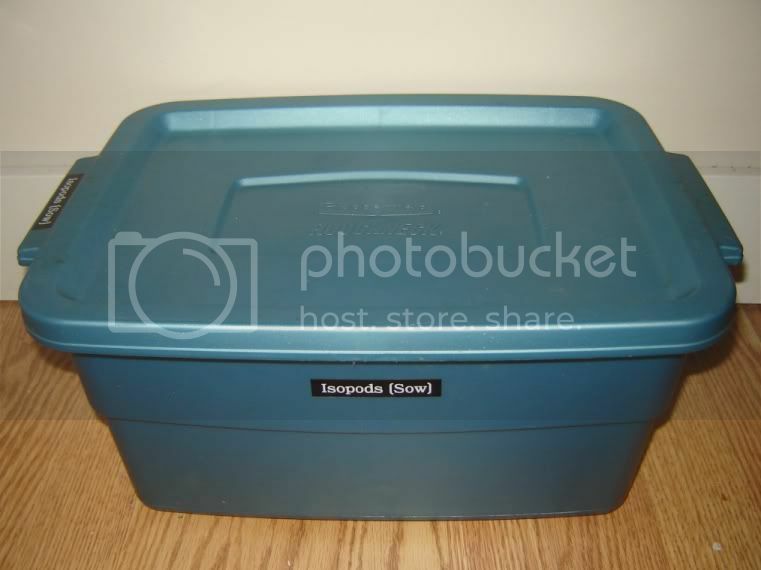 Usually a small Rubbermaid[sup]TM[/sup] container will suffice with a pinhole sized hole higher up in each side for low ventilation. Fill the bottom with 3 or 4 inches of loose coconut fiber and coconut husk. I prefer a mix of both with 2-3 inches of fiber retaining moisture on the bottom and the husk creating an inch or so of large chunks for cover and surface area on the top. By using loose fitting substrate you are creating ideal conditions for microenvironments of higher moisture, increasing surface area for optimal population sizes, and reducing stress by providing areas of retreat. You can also use chunks of cork bark, coconut shells (I'm a coconut pusher... nothing wrong with that), and a large selection of rotting wood and leaves from outside. If you do plan on using debris from outdoors, which doubles as a food source, rinse and then boil/bake it first to remove harmful substances, fungal spores, or invertebrate hitchhikers that may out compete or devour your new isopod colony. Mist this imitation of the forest floor at regular intervals with dechlorinated water to keep it humid and the soil damp, yet never allowing the substrate to become sodden or saturated with water. Place the container in a dark warm spot and you're good to go. Figure 3: Inner enclosure with coconut shell. As stated before, rotting wood and leaves makes a good foundation for any isopod diet, but in the case of rearing them to adequately high population levels to seed several enclosures this is not enough. A hardy supply of leafy greens, cucumbers, carrots, potato, and the odd chunk of fruit like apple, banana, or even banana peel should suffice for plant matter. Protein, calcium, and chitin sources should be supplied as well. This can be done with fish food, chunks of eggshell, and the odd dead cricket or two. The idea is to provide more than enough food to sustain a growing population, yet prevent extensive molding of food sources. A small bit of mold will not harm your colony, but in some cases large amounts can overwhelm and choke out any healthy assortment of detritivores. The best suggestion is to feed small amounts at first to gage how quickly the sow bugs devour their food, increasing the amount as the number of isopods grow. Add in new chunks of food when the last food item supplied is nearly complete to optimize the desired expansion rates. 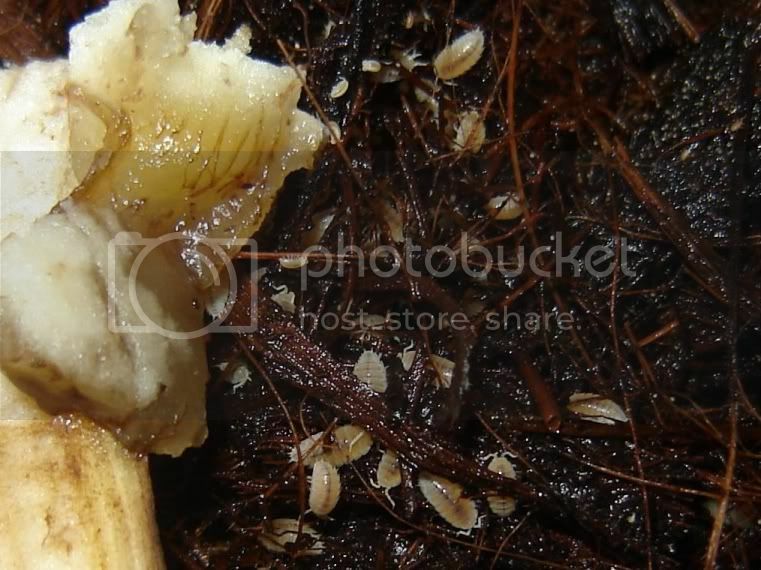 Figure 4: Trichorhina tomentosa emerging for food (Banana). If you've followed the above instructions you're pretty much set for breeding. By keeping them dark, they'll be active and willing to mate both night and day. Though they reproduce at room temperature their population will explode if you keep them between 25-30°C (77-86° F). This is optimal for their natural cycle; just do not expect results overnight. Some isopod colonies can take a couple weeks to a few months to actual begin reproducing at noticeably high levels. Now that we've established how to raise a starter colony to seed various tarantula enclosures it's time to discuss rearing them and the benefits of their use in the tarantula tank itself. 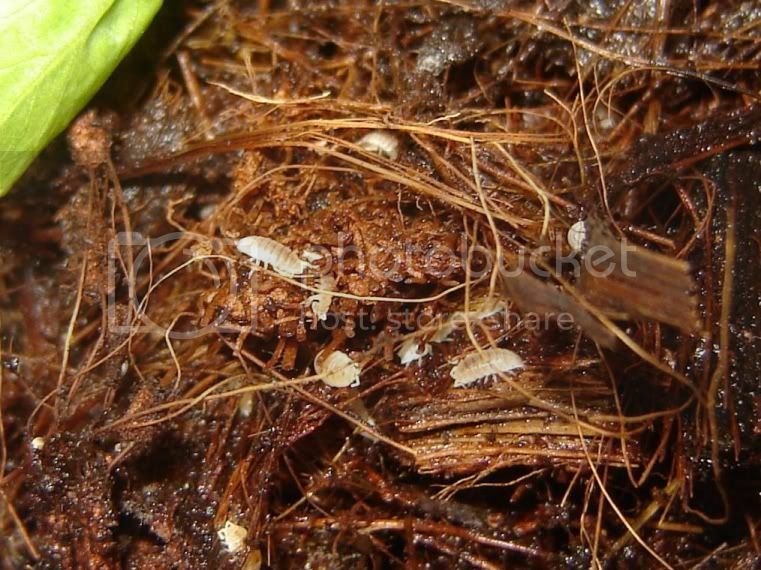 NOTE: Since isopods are crustaceans with gills that need to be kept moist, dwarf woodlice are not suitable for dry terrariums. Trichorhina tomentosa can only be housed in enclosures with moist substrate. 1.Seed with 20-50 isopods per 5 gallon tank. This can be done by grabbing a small handful of soil from the breeding colony, or using a chunk of bark or coconut shell (will he ever stop with this coconut business?) to collect them and transfer them over on said piece. 2.Provide some kind of cover such as a couple chunks of bark or leaves. Though they will hide in the substrate and under water dishes, this additional organic material can create an unobtrusive way to increase surface area/hiding spots and further multiply enclosure colonies. 3.Keep the substrate moist but not wet. You want your tropical tarantula to be comfortable and a humid environment with moist soil should be enough for any isopod to cohabit with your theraphosidae. 4.Provide weekly increments of extra food to keep populations at higher levels. If you provide a small chunk of potato, apple, or cucumber (preferably something that will not mold readily), large groups of isopods will be able to survive. The greater the number, the better job at cleaning and maintaining your tank. 2.Grain and other scavenger mites. 3.Scuttle flies and fungus gnats. This means less cleaning and maintenance for you as well as avoiding the scorched earth policy some hobbyists use to deal with mold, mites, and other unwanted guests. 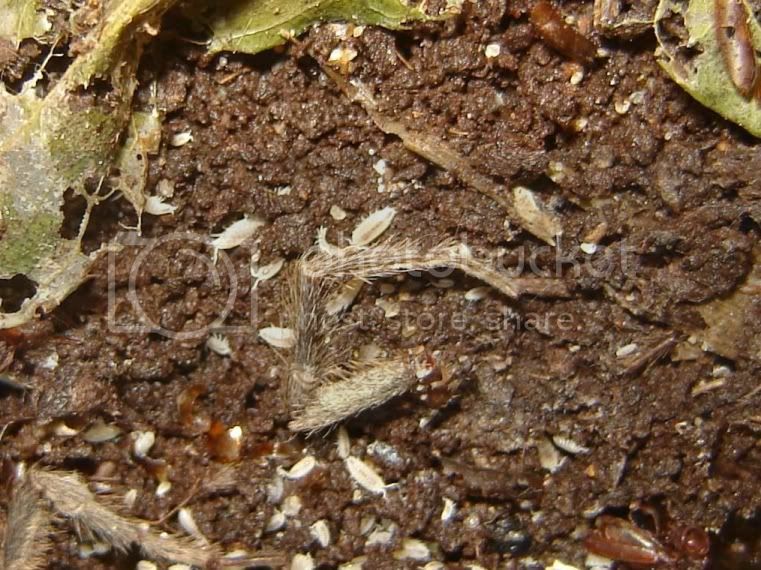 In my personal experience I have also discovered that in my problematic communal/social tanks (too much webbing, heat, and predators), such as Heterothele villosella and Holothele incei, a rare few do become an odd source of food for spiderlings, but are avoided by the adults. Larger isopods, though not the prey of choice for most tarantulas, become a secondary source of nutrients for a dense living arrangement of dwarf species. Within weeks all medium to large sized detritivores disappear, even the ones that seem to taste/smell awful to most tarantulas or typically play dead to avoid impending doom. With Trichorhina tomentosa the adult tarantulas leave them alone since they do not reach a consumable size. This leaves a healthy breeding population even when temperatures reach higher levels. For those with warmer, heated invertebrate rooms or homes that get overly warm during the summer this species will thrive and not die out like the cold loving, heat intolerant species often found outdoors. The greatest benefit I must admit about dwarf tropical woodlice is once again when used in the communal/social tank. Every few months a large assortment of mature males prance around trying to breed with everything that moves. The commotion leaves a few devoured or gorged by females and in a few months the rest grow decrepit and pass on. In either case, though many expire in the open and are quickly removed some do so in unobservable areas. This leaves a rotting corpse that can quickly fowl a tank; thankfully that's where the tropical dwarf isopods come in. In times past when I have left for the weekend I return to find a dead mature male decaying out in the open. Although it has only been a matter of days it is already crawling with a horde of T.tomentosa leaving nothing more than a hollow husk of exoskeleton. Figure 4: Trichorhina tomentosa scattering after removing a deceased Holothele incei Mature Male. To summarize, Dwarf Tropical Woodlice (Trichorhina tomentosa), can become an integral part to the care and maintenance of any tropical species of tarantula. Not only can they be easily acquired from Poison Dart Frog enthusiasts and readily bred, but they can also ease the strain of custodial work for the avid tarantula collector. By introducing this interesting detritivore not only are you adding a natural substitute and component of a tarantula's interspecific interaction and environment, but could quite possibly be extending the lifespan and increasing the health of your pet through increased microfaunal maintenance. Disclaimer: All this can be done by any novice invertebrate keeper whether or not you contract my obsession for the use of coconut related supplies. Very interesting. Have any idea where they are originally from? Also how can you tell the males from the females? Or do they all look alike? Ive been keeping both the tropical woodlice and springtails in my enclosures for nearly 5 years. They do an excellent job, can't recommend them enough. Those were two facts I could not discover a precise answer for when I researched. All I could discover was that they are found in tropical/neotropical zones and that the females carry the young. If you flip a gravid female over you can see she is carrying eggs or young in various stages of development. Sorry I couldn't be of more help. Perhaps someone else who is more enlightened can step in? Hmmm, I'm wondering if I could submit this somehow as an article. Anyway if you enjoyed the read and thought it was informative let me know. I have an itch to begin writing again and wouldn't mind compiling a small collection of articles on other portions of and relating to arachnid care. So this could be about communal set ups (which I keep trying to work on), live plants, other detritivores, etc. If there is a topic you'd like to learn more about that I have an interesting viewpoint on and/or extensive knowledge inform me and I'll author it. Intresting thread and a great read. Maybe I should get me some coco... ooo darn, hooked now.. I think that would be a great idea! There are articles in the 'Arachnopets' section by multiple authors, maybe you could ask to put your on there? Or do you have to be approached by a Moderator or an Administrator first? As for other topics, I see you from your signature that you have a Communal Guide that's coming soon, that would certainly be helpful. Also, I see that you have a lot of experience with Holothele and Heterothele species, maybe something about them? I've been researching them recently, and I find them fascinating! Yes, the OP has definitely 'reminded' me of using more coconut products.. I sent an email regarding the articles on the main page. As for the Communal guide I was going to create a general guide and include various species with detailed information. This would have to be in multiple parts, but would have unique information or housing requirements for each species I've had success with. :clap: Thanks, Abraxas! I enjoy reading your posts and this one's humor was especially charming. I have a healthy, super-fertile isopod colony in my H. lividum tank--there must be 100s of babies in there right now. As my tropical slings grow up I am definitley going to look into the dwarf woodlice for their enclosures. Thanks again!!! Sorry to resurrect, but how is that communal guide coming along? I LOVE your vivariums! I'm getting 2 h. incei soon, maybe I should raise them separately and hope they are male/female, breed them, then put the female in a communal vivarium and hope for an eggsack. I'm a bit scared of killing my first T's besides g. Rosea. I keep these. They do pretty well with anything.